Rotation Brush is an extremely simple but indispensible brush to make objects rotate clockwise or anti-clockwise. What can you do with it? A lot. Animate wheels, gears, snowflakes, balls, falling leaves, space stations and planets. You can make the sun go up or down in the sky, or make the clock hands turn. 1. Select the Rotation Brush from the Add New Animation dialog. The brush is located under the “Animated Brushes” section in the “Warping Brushes” subsection. 2. Click “Apply Selected Animation”. This adds Rotation Brush to the list of Animations on the right. 3. 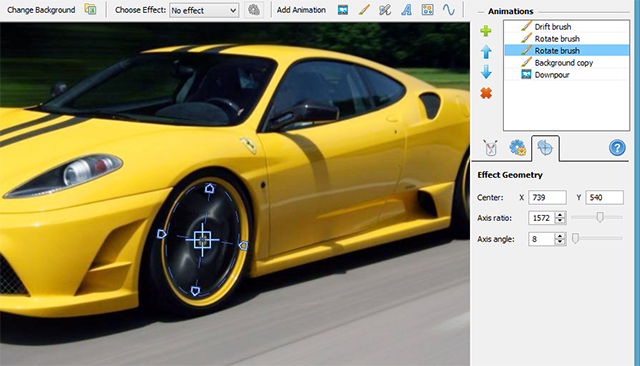 Paint with Rotation Brush just like you do in any other graphic editor. The painted area will rotate according to the specified parameters (see below). Adjust the center of rotation if necessary. Rotation Brush is very simple, so there does not need to be many options. Speed – the speed of the animation. 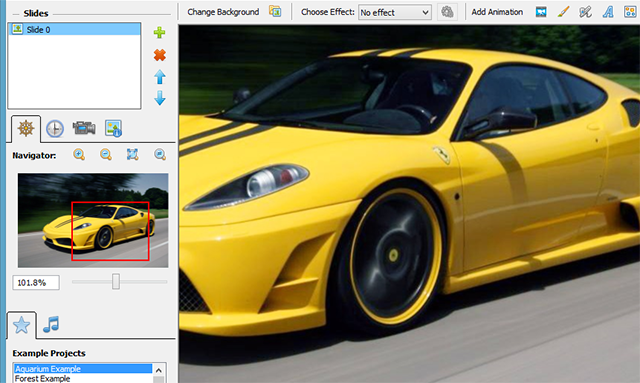 Some objects rotate fast – balls, car wheels and so on, while others require lower values – planets, snowflakes etc. Direction – choose between clockwise and counterclockwise directions. 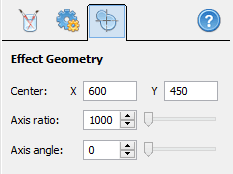 Here, the Axis ratio determines the ratio of two ellipse axes, and the Axis angle sets how they are oriented.